Actually, this whole Climate Portal is educational. HERE is the site map. This class is an introduction to the science of global warming for students without a science background. Students will examine the evidence surrounding climate change from a variety of perspectives and approaches, and, in the process, gain a multidisciplinary understanding of the scientific process. The class has been entirely redone as Global Warming: The Science of Climate Change within the far slicker Coursera platform. You can see the list of MIT OCW earth, atmospheric, and planetary science courses HERE. The UN Institute for Training and Research has e-learning courses. HERE is the current list. What’s the Picture? Answer: The MIT "Roulette Wheels"
The wheel on the left depicts their estimate of the range of probability of potential global temperature change over the next 100 years if no policy change is enacted on curbing greenhouse gas emissions. 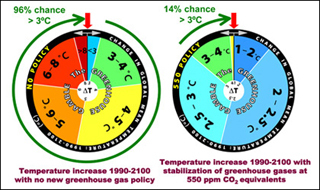 The wheel on the right assumes that an international policy stabilizes CO2 (equivalent) at 550 ppm.